Please refer to our stock # 10467 when inquiring. 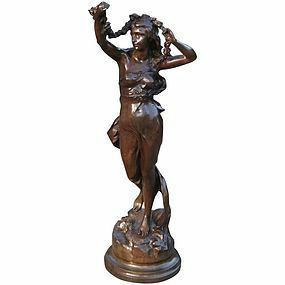 Known as a sculptor of classical and allegorical figures, Germain was a student of Dumont and Gumery. He worked with his brother Gustave in producing classical and historical statues and groups. Germain exhibited at the Paris Salon from 1866 to 1879 and later at the Salon des Artistes Français where he became an Associate in 1889. His bronzes include various images of Joan of Arc, Dido and Aeneas, The Harp Player, the Young Flutist and an Arab on his Camel.